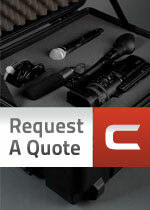 Investing in custom case or racks ensures your equipment will be secured with unsurpassed protection. To be of any worth, a transit case needs the durability to take whatever the situation presents and still provide ultimate protection. Caseman’s engineering team has long term experience in designing everything from simple foam inserts to extremely complex rack systems for use in dramatically different transit, warehousing and use conditions – including mission critical military and industrial situations.